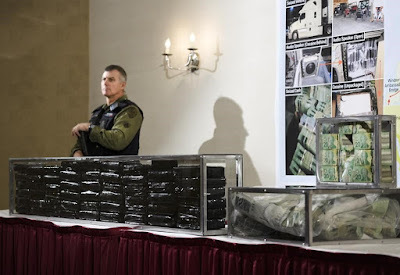 Cops in Ontario busted an international cocaine smuggling operation with links to Mexico and the United States after a large drug seizure at the border. The investigation dubbed "Project Tattler" began in December 2017 and has led to the arrest of three Ontario men, the seizure of 55 kilograms of nearly pure cocaine and about $800,000 in cash. 96% pure cocaine came into the country on a transport truck from California via Mexico. Slobodan Poznic, 44 was charged with importation of drugs and various trafficking-related offences. Michael Nagtzaam, 35, and Abrahan Brito, 32 have also been charged.